Until I read 'Shrinks,' I never really understood psychiatry as either a profession or a medical science. I knew about bits and pieces. Sigmund Freud was over here, looking like he belonged in a Rocky and Bullwinkle cartoon. Bob Newhart was over there, the wise-acre wise man we all want to advise us. Hannibal Lecter may have been in chains, but that offered us no protection. The DSM IV was in my bookshelf, trying to turn it all into non-narrative non-fiction. Michel Gazzaniga, Richard Cytowic, and David Eagleman were manning the MRI consoles. Mind, brain, soul, talk, flesh — how did it all fit together? Along comes Jeffrey Lieberman with the delightful and engaging 'Shrinks: The Untold Story of Psychiatry' to make scientific and social sense of how we see ourselves. With grace, elegance and wit, readers are immersed in the story of a troubled science. The book is divided into three sections; The Story of Diagnosis, The Story of Treatment and Psychiatry Reborn. Lieberman's smart breakdown hooks readers with a combination of anecdotes, history, and science carefully threaded through some two-hundred-plus years populated by charismatic characters, some of whom were actually on to something. Lieberman is a former President of the American Psychiatric Association. He's entertainingly blunt when it comes to the missteps made in the name of psychiatry, from Franz Mesmer to Wilhelm Reich. 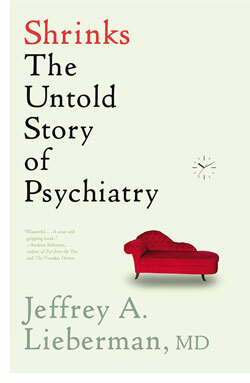 This is important because, as we learn in the course of reading this book, psychiatry has been a science within which heated battles have been fought between factions espousing different beliefs and different approaches to studying the human mind and to curing those whose minds were not helping them. Of course much of the controversy starts with Sigmund Freud. Lieberman does a masterful job of clarifying his triumphs and observing how his faults led both Freud and the entire science astray. Readers who want to experience a fascinating and intense story of scientific politics need look no further than this riveting story within the book. And since we live in a world where science is increasingly politicized, there are valuable lessons to be learned. Lieberman's prose is crisp and his stories are often darkly humorous. He has a great feel for when to inject his own experiences into the story he is telling, and this is important. He joined the profession at the cusp of a great shift in thought and practice. From talk therapy to drug therapy to neuroscience, here is an example of science at work and in a healthy debate with itself, in this case, debunking itself on a quest to truth. For all the readers out there who are enjoying the current conquests of neuroscience, Lieberman provides a great counter-story. The battle for the soul of the DSM provides a turning point for the science. Set against the backdrop of Lieberman's own professional life, we get a compelling personal tale in parallel with the arc of a science in the midst of change. Lieberman has a delightfully light touch but retains the ring of authority throughout his history. 'Shrinks' is an accomplished feat, a smart story of science in flux that brings a lot of clarity to our quest to explore what is truly the final frontier — our own minds.